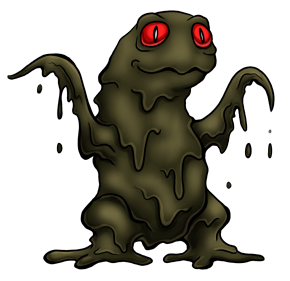 This Kreature is the meta-form of Slimok. It will devour its prey by swallowing it whole and engulfing it, but if it isn't hungry, it will immobilize its victim by wrapping it in a cocoon of slime and saving it for later. Food can be stored for months at a time, as these storage cocoons keep it well preserved. It reproduces asexually by tearing off its own head. While it regenerates a new one, the now decapitated head turns into a Slimok.